While traveling we had a birthday party for a very special 3 year old. She wanted a totally pink birthday so we made a number of appetizers that had pink in them. 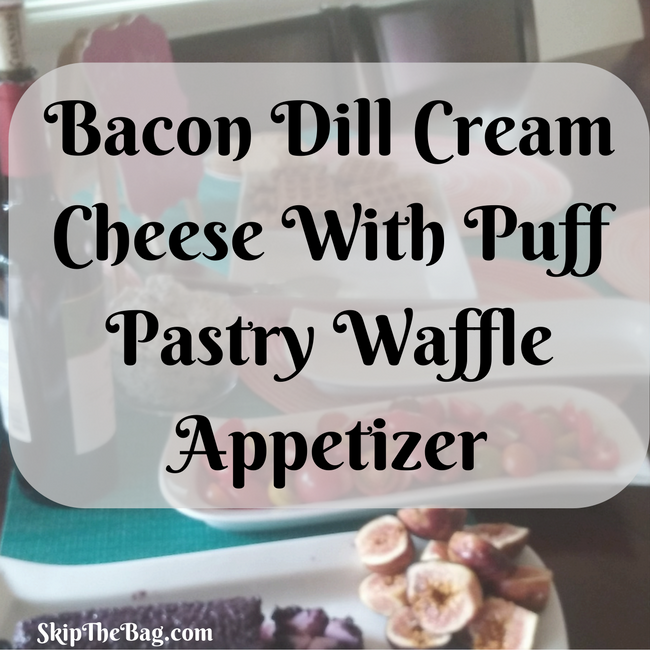 My favorite was the bacon dill cream cheese and puff pastry waffles appetizer. To make it 'pink' we served it with smoked salmon. Unfortunately I don't have any photos of it with the salmon (cause I was too busy eating it all!) So this recipe is just for the cream cheese and puff pastry waffles. This was incredibly easy to make and were a big hit! First defrost puff pastry and cut it in half. 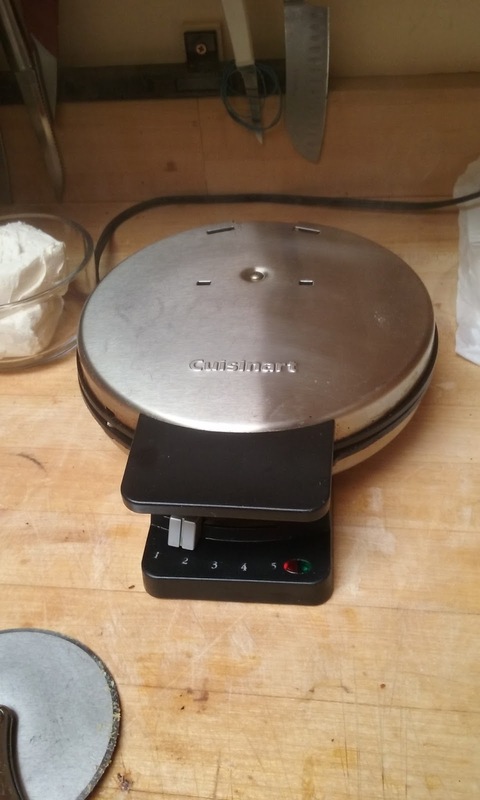 Next cook the puff pastry into a waffle iron. Cook until browned. It took us about 3 minutes. Slice the puff pastry into squares while it is still warm. As the pastry cools it gets very flaky and will not have crisp lines if you cut it after they cool. A pizza cutter worked extremely well for this. In a bowl mix dill, bacon, cream cheese and salt and pepper to taste. Blend well. Serve waffles with a knife to put on cream cheese and top. If you look hard you can see the plate of waffles and the bowl of cream cheese (next to the wine bottle) in the picture below. 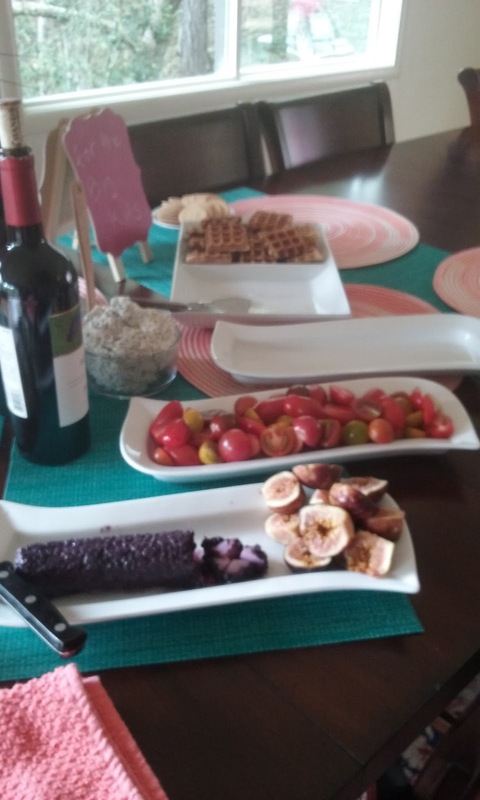 You can also see the red and yellow tomato slices and the blueberry goat cheese with figs. We've got a pretty special 3 year old that rates all this! 6 slices of bacon, cooked and diced. 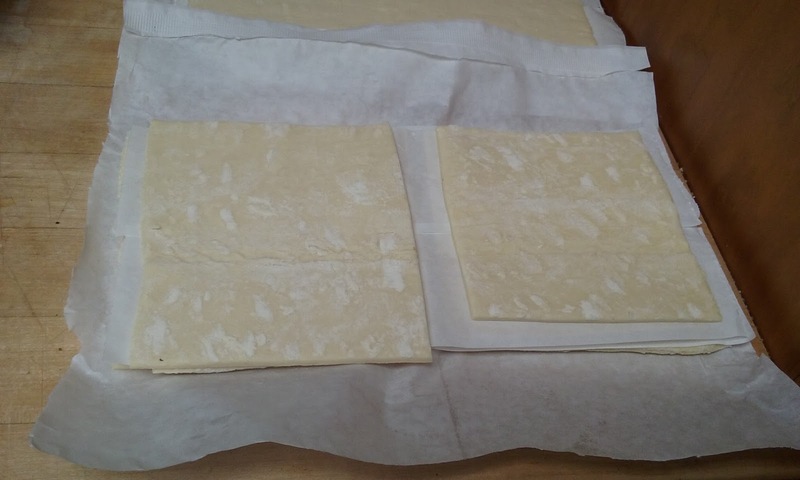 Defrost puff pastry sheets, cutting them in half. 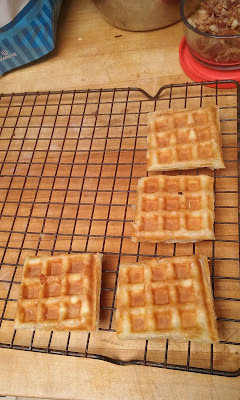 Cook in a waffle iron until browned (about 3-4 minutes), Slice into squares. 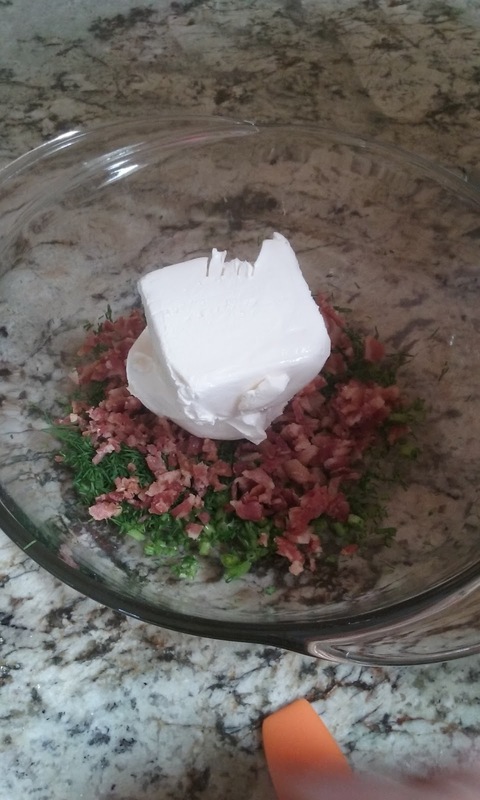 Combine cream cheese, dill, bacon and salt and pepper in a bowl. 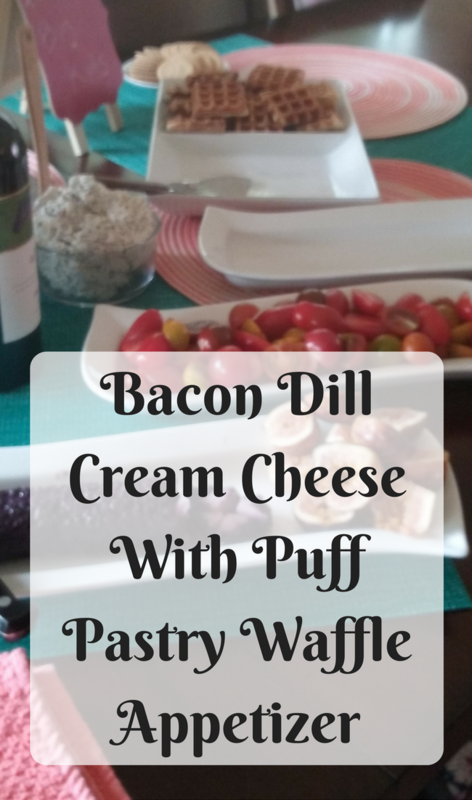 Serve waffles as crackers with cream cheese dip. I love the idea of this!! 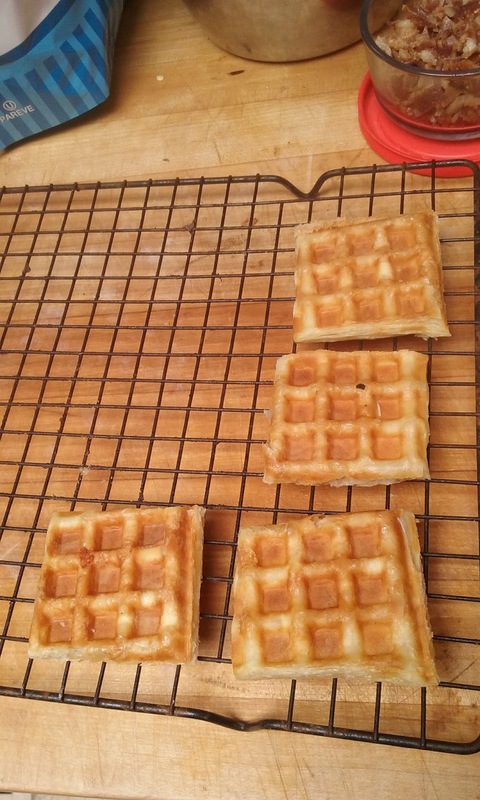 never thought to put the puff pastry in the waffle iron...Thanks for sharing on My 2 Favorite Things on Thursday Pinned!